The Lafayette Fire Department conducted a Drivers Ed Safety seminar with impressive demonstrations for the ASA Drivers Education-38 class. As part of our commitment to Acadiana’s young adults, ASA has been fortunate to have LFD participate in our Expanded Learning Program. Drivers Ed-38 class students learned the importance of safe driving through the perspective of firefighter experiences, reinforced with demonstrations. From the moment LFD arrived at ASA Headquarters with a Fire Truck and one of only two Rescue vehicles, the students looked out the window as questions sprouting from most everyone. 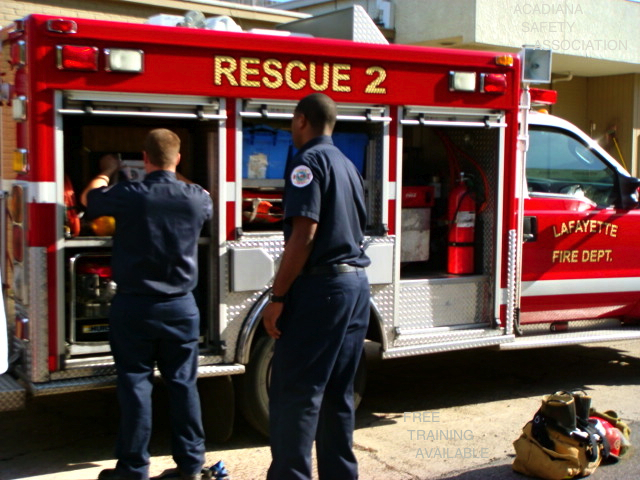 Eager to take advantage of this unique opportunity, gaining access to Firefighters and their equipment in casual and approachable environment, students gathered round without instruction. Captain Jason Benoit captivated the ASA staff, instructors, drivers ed students, and several other civilians, leading off by sharing that LFD has been called out to over 580 vehicle calls in this month alone, then describing some of the most eye opening descriptions of vehicle crashes involving young adults. 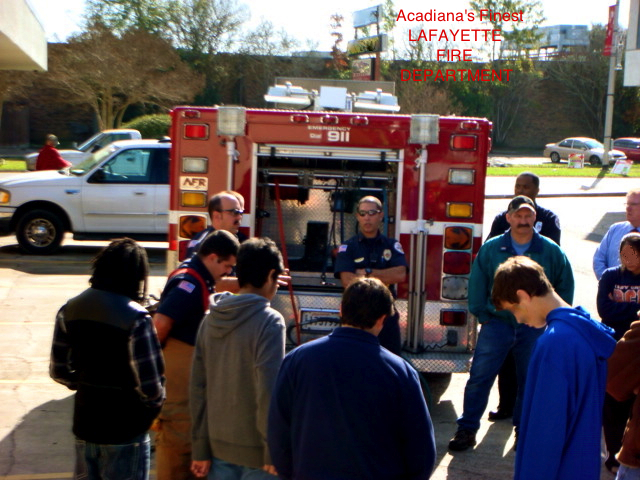 Captain Johnny Monette lassoed and drew in students with his driving safety experiences in Acadiana, while transitioning students into firefighter tool demonstrations. Firefighter Morrell Broussard opened the panel doors on the Rescue vehicle, exposing what has always been a mystery to all of us. 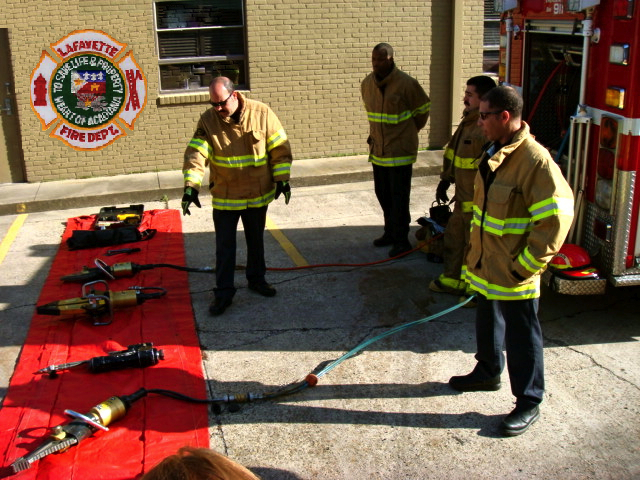 From the shadows within came hydraulic rescue tools, rams, spreaders and cutters, made famous by the term “Jaws of Life.” Engineers Mickey L. Broussard and Garrett Guidry handled these giants with seemingly no effort, setting them down on a red tarp for protection. The vivid pictures of a wrecked vehicle fresh in our minds, Engineer Mickey L. Broussard and Engineer Garrett Guidry explained each tool in detail, placing us at this side as each tool came to life. Firefighter Morrell Broussard noted a little known fact about electric cars, which not one of us had ever considered. Some electric cars can have 500 volts running through them as we drive along snickering at gas pumps we pass. This can be life-threatening firefighter as they extract people from crashed vehicles. Then consider 15 years from now, our Louisiana environment, and the wires that protect us from the 500 volts; a reference to dry rot, a cracking or degradation to rubber products over time, like tires. Great, just as we have all fallen for cute electric cars, now we have to wonder how well built these vehicles really are. Engineer Mickey L. Broussard presented us with what appeared to be a simple, yet thick black pad. 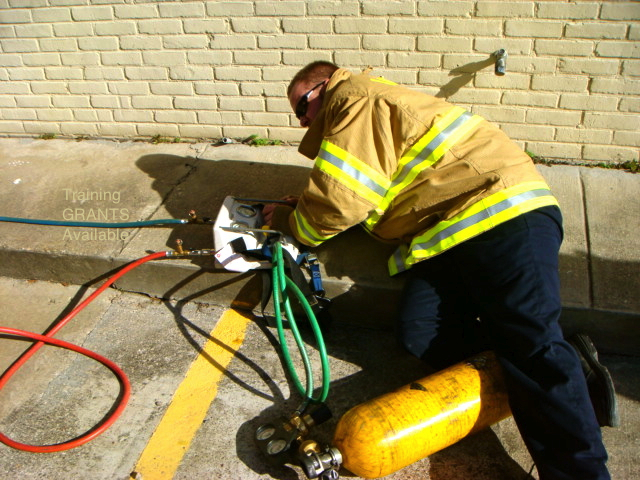 Meanwhile, Engineer Garrett Guidry lay on his side to setting up a similar pad under the fire truck. Once activated by controls, this nothing of a pad, lifted the 56,000-pound fire truck. Simply put, most impressive by any standards. Several of the Drivers Ed-38 students actually took a step back, in awe of this feat. Hydraulic extraction equipment became imbedded in our vernacular forever. 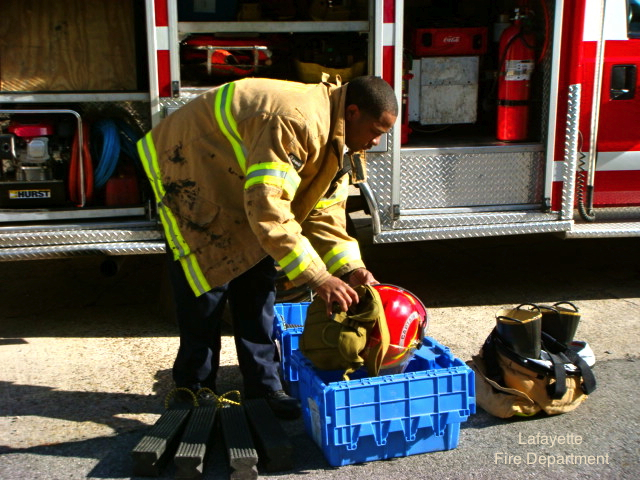 Captain Jason Benoit allowed us to approach the Fire Truck, Rescue vehicle, equipment, and tools, as each member of the Lafayette Fire Department fielded questions flying at them from every angle. A few students dabbled around the “Jaws of Life,” and were allowed to lift it with assistance. 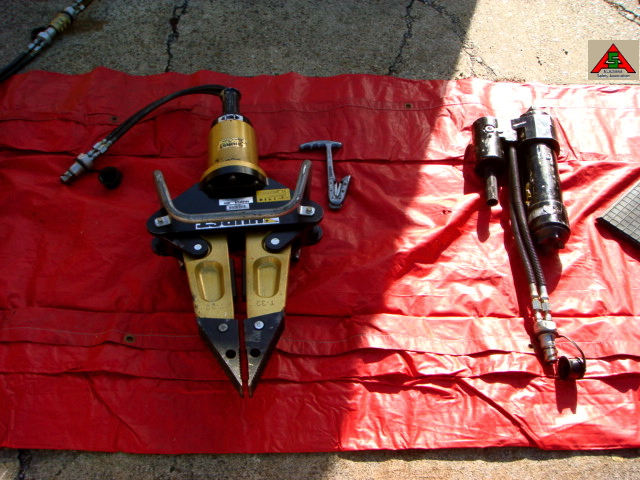 We have all seen firefighters holding this hydraulic tool at strange angles over their heads, off to their side, but until you actually place your hands on one, you will never know heavy this tool really is. Firefighters were now being referred to as heroes; one student stated how firefighters must be superhuman. 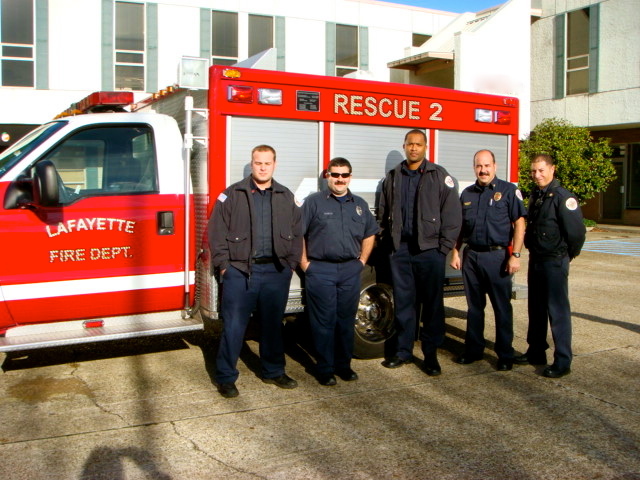 As expected, Lafayette’s finest shrugged off the compliments, crediting adrenaline instead. Seems fitting, since most heroes avoid the media, cameras, and publicity in general. Distant and invisible, stood another stellar example of Lafayette’s finest, Chief Leonard Blackwell Jr., attentive to every detail. It was Chief Leonard Blackwell Jr., who is the brainchild of the Expanded Learning Program, who alone organized this entire safety seminar and demonstration. Chief Blackwell has great foresight and genuine concern for our young adults, as they gather steam to attain driving privileges. The Safety Seminar experience has been a privilege, and Acadiana Safety Association would like to thank everyone included in this passage. 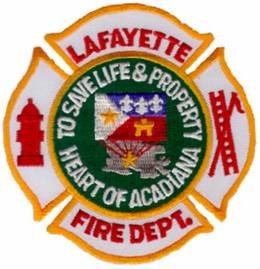 ASA would also like to extend our sincere appreciation to Chief Robert P. Benoit, Director of Lafayette Fire Department. Under Chief Benoit’s leadership, evolved a fire department dedicated to the safety of all Acadiana, allowing the creativity and development of our Expanded Learning Program to indwell in the minds of young adults and the importance all realms of safety plays in a our lives.